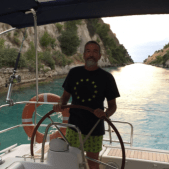 Alfons, 60 years old, born in Reus (Catalonia – Spain), qualified RYA / MCA Yachtmaster Ocean, Commercially endorsed , Patron Profesional de recreo y Capitan de Yate.. Also Master in Business Administration from ESADE in Barcelona, ​​ Ski instructor and PADI. Alfons, the captain of the new Beneteau Oceanis 62 is waiting for you to make the most of your vacation. Maribel, 59 years old, born in Reus (Catalonia – Spain) looks forward to welcome you on board. She loves cooking and she has a deep understanding of the famous “Catalan chef’s secrets”. She has the great virtue to create something special with just a few ingredients, which is highly appreciated on board, and she will be helping in the kitchen giving a hand to all the passengers to bring all dishes to an absolute success. Alfons and Maribel have done an important live change. 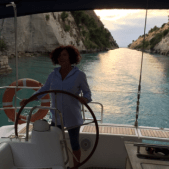 After working very hard for many years in their previous businesses, they have released their free spirit and they are now very excited of doing what they had always wanted: brining Sailmoments to live! We are very happy to host you in our magnificent Beneteau Oceanis 62 and share together our passion for sailing.